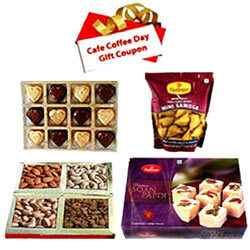 Celebrate with your loved ones as you send online this Non-Satiable Desire Dry Fruits and Chocolate Hamper and increase happiness in their lives. This Hamper is complimented with 100gms Assorted Dry Fruits, 250gms Haldiram Soan Papdi, 200gms Haldiram Mini Samosa, 12Pcs Homemade Assorted Chocolates and Rs. 500 Cafe Coffee Day Gift Vouchers.